There are a huge number of day trip opportunities from San Jose. For me, the best kind of day trip is one with some variation. One where you can combine action with relaxation or indeed nature with history. 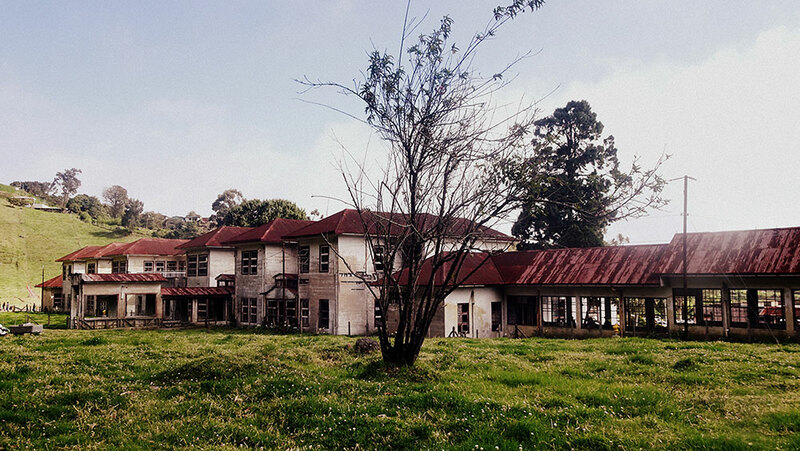 A visit to the Irazu volcano and the Duran Sanatorium will introduce you to one of Costa Rica’s most stunning natural treasures as well its most haunted historical site! We took the 8 am bus leaving opposite San Jose’s National Theater and were one of the last people allowed on. It was Sunday and this would be the only public bus heading up to Irazu National Park. The 50 people still standing outside of the bus stop would have to find another way to get to there. Irazu is a gorgeous and notoriously erratic volcano. The last eruption was as recent as 1994 and the next one could be tomorrow. With more and more people flocking to Irazu, especially with the recent restriction posed on the Poas Volcano, arriving as early as possible is key. We got there pretty early and were still met by a long row of cars that beat us to it. The driver said it was only a 2 k walk and whoever wanted to get off the bus, could do so. My husband and I decided to walk but what the driver didn’t tell us was that only vehicles are allowed through the entrance. With the bus 2 km behind us and the line moving slowly, we decided to join another family in their car with only 3 more vehicles ahead of them. If you are not a resident, prepare for the steep 15 dollar entrance fee. If you are, you only pay 2 dollars. Once inside, you can take a short hike to the 3432 meter summit and then head down again to view the craters up close. The summit was windy, cold and sadly very clouded. We didn’t see much from up there but luckily, the skies cleared up for 10 minutes once we were down. The crater lake is a glorious sight and one you will be lucky to see through the almost eternally cloudy Irazu volcano. As a history buff and amateur photographer with a particular love for ghost stories, I definitely wanted to stop at the Duran Sanatorium on the way back to San Jose. Public buses to San Jose and Cartago leave the volcano at 12:30 and with the time we saved joining the nice family in their car, we made it back to the parking lot with 10 minutes to spare. Unfortunately, an accident further down the road had forced us into yet another long queue. At this point, the sanatorium was only 3 km away so we decided to walk again. This time, we could enter without a car and I only paid 2 dollars at the entrance. They say the Duran Sanitarium is the most haunted place in Costa Rica. The sanatorium has had many different lives but it started out as a tuberculosis hospital in the early 20th century. The altitude was believed to be beneficial for those suffering from the disease and the peaceful surroundings were expected to promote healing. Next to tuberculosis patients, Duran Sanitarium also opened its doors to those suffering from mental illness. The Sisters of Charity are said to have treated up to 300 patients here. A highly infectious disease, mental illness, nuns, … Is a haunted picture starting to show? No ghost story would be complete without a personal tragedy. Carlos Duran, the original founder the sanatorium is named after, is said to have built the hospital because his daughter had contracted tuberculosis. Yet another story tells us that she fell victim to the disease while working in the hospital. Whichever version is true, the tragic family history definitely adds to the dark mystery shaping these ruins. With the threat of tuberculosis having passed by the early 1960’s and the mentally ill haven been transferred to specialized clinics, the hospital needed a new calling. For the next 10 years it would serve as an orphanage and a prison. As far as I’m concerned, this ties the bow neatly around the ghost stories the Sanatorio has accumulated and the historical gift it now has become. After the structural damage caused by Irazu’s temperamental nature, the building fell out of use. Today you can visit the ruins and see history combined with what some would call vandalism, but I would not. Original features and walls carry graffitied phrases or artwork all over the estate. You are allowed access in every building but one, which is deemed unsafe. It may not seem that way in the photos, but the sanatorio can get very busy. It can somewhat kill the atmosphere if you let it. But with the huge number of rooms open for visits, you can sometimes escape the crowds and be completely alone. We knew the way back was going to be tricky. Looking a bit further up the hill, we could see that traffic was still held up by the accident on the bridge. Luckily, we were able to catch a ride with a lovely guy who was heading back to Alajuela. He was nice enough to drop us off in Cartago where we wanted to grab a bite to eat before heading back home. We arrived in Cartago around 4pm and treated ourselves to a flavorful casado at a local Soda. As we sat down to eat, the bus we had initially taken at 12:30 finally passed us by. Some people on board definitely looked grumpy.